Clinton’s “basket of deplorables” can't be compared to “47 Percent” quote. 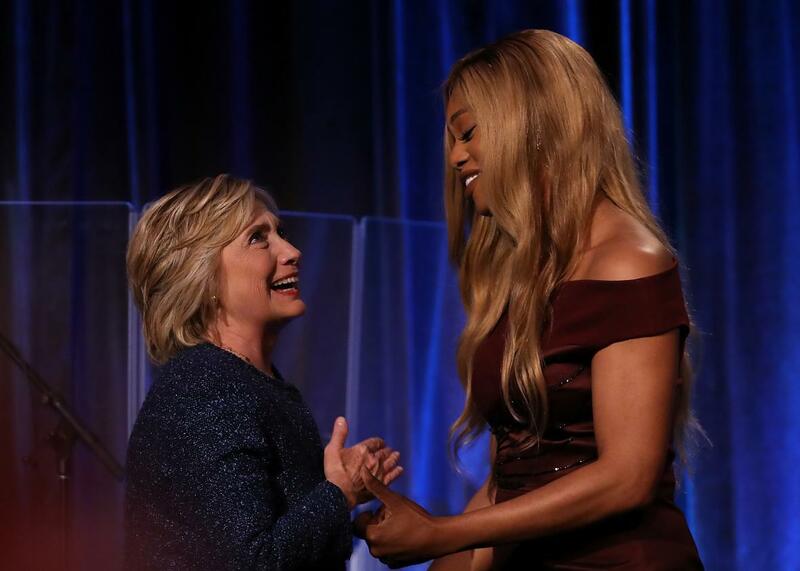 Hillary Clinton greets actress Laverne Cox during the LGBT for Hillary Gala at Cipriani Club on Sept. 9, 2016 in New York City. Hillary Clinton has straight-out called Donald Trump a racist who is “offering a dog whistle” to the most extremist, hateful portions of American society. But now Republicans are acting very shocked that Clinton would say that around half of Trump’s supporters could be classified under the broad heading “basket of deplorables,” meaning racists, sexists, homophobes or xenophobes. In other words, people who would never vote for Clinton. The Democratic presidential candidate’s use of the word half immediately made Republicans associate it with Mitt Romney’s infamous “47 percent” line from the 2012 campaign that was secretly recorded. Except, you know, this event was covered by the press and her statement—read in context—was actually a call to arms for her supporters not to automatically dismiss someone as irredeemable just because he or she happens to support someone like Trump. I know there are only 60 days left to make our case—and don’t get complacent, don’t see the latest outrageous, offensive, inappropriate comment and think well he’s done this time. We are living in a volatile political environment. You know, to just be grossly generalistic, you could put half of Trump’s supporters into what I call the basket of deplorables. Right? The racist, sexist, homophobic, xenophobic, Islamaphobic—you name it. And unfortunately there are people like that. And he has lifted them up. He has given voice to their websites that used to only have 11,000 people—now [have] 11 million. He tweets and retweets their offensive hateful mean-spirited rhetoric. Now, some of those folks—they are irredeemable, but thankfully they are not America. But the other basket—and I know this because I see friends from all over America here—I see friends from Florida and Georgia and South Carolina and Texas—as well as, you know, New York and California—but that other basket of people are people who feel that the government has let them down, the economy has let them down, nobody cares about them, nobody worries about what happens to their lives and their futures, and they’re just desperate for change. It doesn’t really even matter where it comes from. They don’t buy everything he says, but he seems to hold out some hope that their lives will be different. They won’t wake up and see their jobs disappear, lose a kid to heroin, feel like they’re in a dead end. Those are people we have to understand and empathize with as well. No matter the intent of the remarks, Republicans immediately smelled gaffe and pounced on Clinton for the comments. Trump himself criticized Clinton on Saturday morning. “Wow, Hillary Clinton was SO INSULTING,” Trump wrote on Twitter. Wow, Hillary Clinton was SO INSULTING to my supporters, millions of amazing, hard working people. I think it will cost her at the Polls! Many Republicans also expressed outrage. Republican pollster Frank Luntz quickly referred to the statement as Clinton’s “47 percent moment.” “Hillary Clinton just insulted millions of hard-working Americans simply because they don’t want to vote for her,” Luntz tweeted after Clinton’s comments began spreading on social media. Tonight, Hillary Clinton just had her "47 percent" moment. In other words, Romney talked down to and dismissed the importance of poor people, while Clinton talked down to and dismissed racists, xenophobes, and homophobes. A slight difference. Plus, Romney was talking about people who may have actually chosen to support him, whereas Clinton was referring to people who in no way would vote for her. So the risk of alienation really isn’t that great to begin with, although of course it could make the most fervent Trump supporters more fervent. Whatever the semantics, the Clinton campaign also quickly came out to clarify statements and suggested that Clinton really was referring to those who actively support Trump and go to his rallies. The campaign also made the obvious point that none of what Clinton said is really new, she’s been pushing the same message for a while. “She gave an entire speech about how the alt right movement is using his campaign to advance its hate movement,” Clinton spokesman Nick Merrill wrote on Twitter. (3/3) And their supporters appear to make up half his crowd when you observe the tone of his events. (2/3) Obviously not everyone supporting Trump is part of the alt right, but alt right leaders are with Trump. No matter. Trump’s camp is seizing the opportunity and taking umbrage. Campaign manager Kellyanne Conway even said that Clinton should apologize.